The age of Vámbéry was the period of the birth of modern geographic science, and of the foundation of scientific societies that made possible the exchange of ideas. The geographic society of Paris was founded in 1821, that of Berlin in 1828, and that of London in 1830. In the heyday of scientific discoveries these organizations supported and advocated the expeditions launched for the better understanding of the Earth, and had a great part in the popularization of the geographic knowledge. 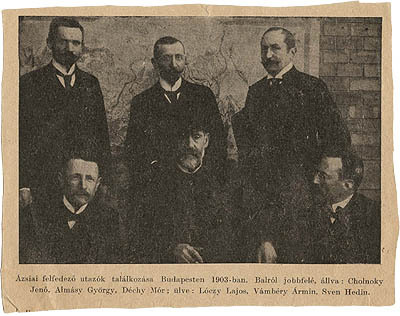 The Hungarian Geographic Society was founded in 1872 on the initiative and with the leadership of János Hunfalvy, head of the first university department of geography founded just two years earlier, and it had 10 founding members (Ármin Vámbéry, Antal Berecz, Albert Bieltz, Pál Gönczy, Frigyes Reitz, József Szabó, Kálmán Szily, Ágoston Tóth, János Xantus and Mór Déchy). Terram mente peragro – I wander the Earth with reason. This was the idea proposed in 1873 by Ármin Vámbéry in his opening and evaluation speech as the program of the society, and which has since then become the slogan of the Hungarian Geographic Society. 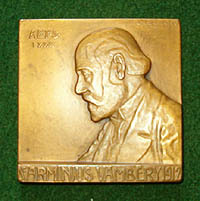 Vámbéry, from 1872 to 1888 Deputy President of the society, took a very active part in the work. In many cases he read the yearly account instead of the President of the society, he read lectures, and regularly published in the journal of the society, the Földrajzi Közlemények, published since 1873. In 1889 he was elected President of the society, but in 1890 he resiged, with reference to his other activities. On the proposal of the Secretary-General, in 1893 he was elected for his merits as a honorary president, and since 1897 he wore together with Béla Széchenyi the even more prestigious title of the constant honorary president. In this capacity Vámbéry was a regular participant in festive events and sessions. At the receptions of genuine celebrities and worldwide known travelers it was entrusted upon him to greet the guest in the name of the society, and introduce his lecture. So happened for example in 1898, when the Norvegian polar explorer Fridtjof Nansen, or in 1903, when the Swedish Central Asia researcher Sven Hedin – both honorary members of the society – read their lectures. Vámbéry several times spoke at the sessions of the Royal Geographical Society, and could personally experience, that in Britan the explorers are almost more appreciated than scientists and artists. In 1865 his English-language work, the Travels in Central Asia received lots of praise, but it did not won the highly appreciated golden medal of the society, only a cash prize. Vámbéry had good relations with Lord Curzon the famous traveler and statesman, between 1911 and 1914 president of the RGS, who remembered him in his book on Persia as well. In 1902 Béla Erődi, the President of the Hungarian Geographic Society greeted the great old man of Hungarian travelers on his 70th birthday. In 1911 an advertisement appeared in the Földrajzi Közlemények, which called attention at the nearing 80th birthday, announcing that the scientific associations will officially greet Vámbéry, and will give over to him a memorial plaque created by Jenő F. Körmendy. In 1912, on the 40th jubilee meeting of the society it was Ármin Vámbéry to hold the presidential inauguration. He finished his speech by saying, “I hope I will be able to celebrate in this place the 50th jubilee as well.” This, however, was not given to him. 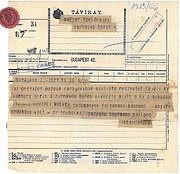 On his death in 1913 condolence letters and telegrams were sent to the society from all the parts of the world. There was no geographic society that did not express their compassion over the death of the great traveler and Oriental scholar. In 1932, on his 100th birthday the Hungarian Geographic Society solemnly remembered their former world famous president in the Officers’ Casino.